One of my best friends vehemently recommended this book (and book #2) half a year ago, and reader recommendations for it continued over the last few months. While I believe it is considered “YA” it doesn’t have that YA feel of high school drama, backstabbing and whatnot. This one is deep. VERY deep, and while intense romance and steamy scenes were not a part of the story, the emotional connections to the main character’s past, and current reality are strong enough that nothing else matters. This book is not about “teen drama”. It is about unavoidable circumstances, consequences and choices. And even then, one wonders if there was ever any choice at all. This book opens up a realm of possibilities, regarding one’s belief system. You’ll find yourself fluctuating between acknowledging the randomness of being at the “wrong place at the wrong time”, and an obligational acceptance of the natural turn of events. But through the eyes of the main character, via her memories, and through her grasp on her new reality, you’ll also find yourself wondering… exactly what IS it all about? What is living, why can life be so randomly taken away, and what might come after it? Stuck between life and death, can one really choose? Mia is a quiet high school student, good enough grades, plays the Cello (wonderfully, but not considered necessarily a virtuoso), loves classical music, and has a wonderful family. Fun, ex-rocker parents (who get a kick out of her “classical” side) who have still retained enough of their music loving ways to still be “cool”. An adorable little brother (Teddy) who may be bratty but adores his big sister with all of his heart. *sigh* okay. Getting myself together. As I was saying… she has a great support system, and a normal high school life. Nothing about her childhood or her current life is out of the ordinary. Oh, except for the fact that she is dating the popular high school rock star (Adam) who is her complete opposite in terms of “outgoingness” and of course, there are some issues with that. But they’re beautiful together. Easy going, slow and steady. It’s all good. And you’ll adore Adam. 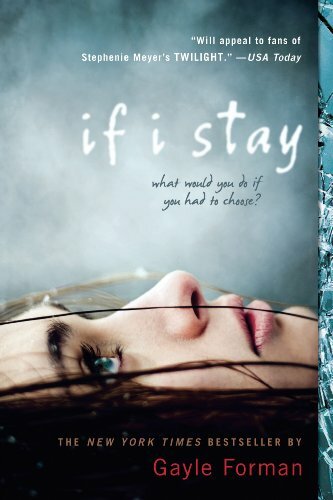 But Mia’s life takes a turn for the worse when she is in a devastating car accident. … the last bit of life in the car dies, and the music goes with it. It isn’t long after that the sirens come. I actually have to ask myself this. And as her life hangs in the balance, (it’s seems her “soul” has left her body but is still hanging around), she experiences life almost as a ghost in the hospital corridors. She remembers. She listens. She learns. The pragmatic doctors, their no-nonsense prognosis, the spiritual nurses with faith… her family and friends that surround her. And what she learns might make all the difference in her world. If the patients inside these a rooms are like me, why then can’t I see the people outside the people? Is everyone else loitering about like I seem to be? I’d really like to meet someone in my condition. I have some questions, like, what is this state I’m in exactly and how do I get out of it? I really enjoyed it! I couldn’t put it down, and was dying to know where this was going. My heart broke a few times, but not only because of her current situation. It was our “living” her beautiful life through her memories, the moments that made her who she was. And of course, as she absorbs her current situation and tries to understand what is happening to her, the moments today, that could decide her future. By the way. I loved this one, but book#2… WOW! That review coming up next (but if you haven’t read this one yet, DO NOT got to my review of #2). This was a series that once you are done it takes you a couple of days to come down from it. My heart hurt for her and everyone in the book. Loved it! I would love to read more like it!! Me too… I kinda wish she made a trilogy… that whole “middle part” ya know? I loved it too! I feel like I want more than middle I want beyond the end of the second book. You dealt with death in both books how about liife and renewal of family together. They need to have there own Teddy!